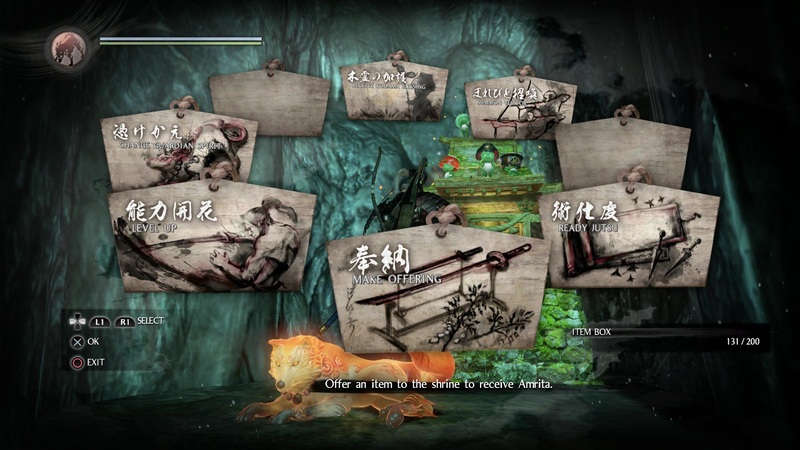 A detailed look at each shrine attribute in Nioh. Shrines are a crucial part of progression in Nioh. Similar to the bonfires in Dark Souls, Shrines act as a save point and spawn location upon death. Shrines are also where you go to level up, receive Kodama blessings, summon a player, and manage your Jutsu skills. This guide will briefly explain how to use each of these important features so that players can fully benefit from what the Shrines have to offer. 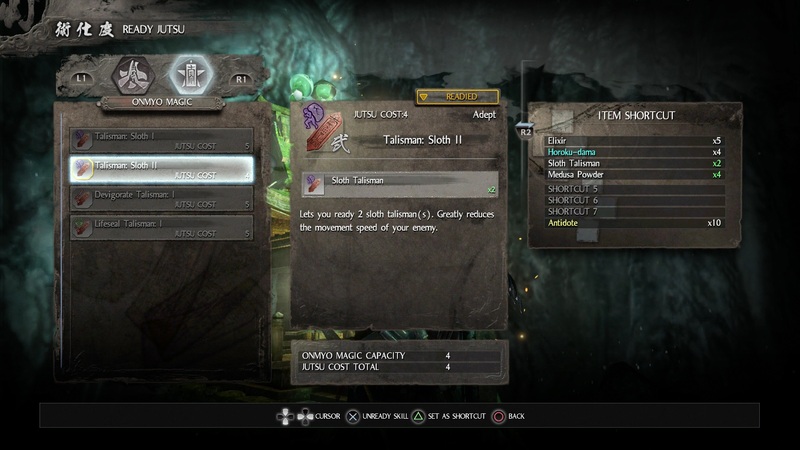 The Level Up tab of the Shrine menu is one of the most important features in Nioh concerning your character’s progression. This is where you go to spend Amarita to level up each of your character’s personal stats. The Level Up menu features a list of Core Stats that affect your Life and Ki amounts, as well as your carry weight, skills, guardian spirit, and weapon attributes. Secondary stats, such as skill points, skill capacities, and spirit bonds can be influenced in this menu as well. You’re going to spend a lot of time in the Level Up menu, so it’s best to familiarize yourself with each attribute as early as possible. The Make Offering section allows you to transfer unwanted items to the Shrine in exchange for Amarita. Amarita is the currency you receive upon killing enemies while exploring in Nioh. Like souls in Dark Souls, Amarita is spent to level up your character, and can also be used to purchase some items. When you die, you drop your accumulated Amarita along with your Guardian Spirit wherever you fell, but you can return to your grave to retrieve both of these lost items as long as you don’t die again along the way. If you’re in need of a quick amount of Amarita, utilize the Make Offering tab to exchange unwanted items. As we mentioned, you can retrieve your dropped Amarita and Guardian Spirit by returning to a grave where you died. However, sometimes your grave is in a hard to reach location, and the Amarita you dropped is not worth the trip. By using the Call Back feature at the Shrine, you can simply retrieve just your Guardian Spirit instead. Calling back your lost Guardian Spirit requires a certain amount of Spirit, and you will lose any Amarita that your grave once held. There are multiple Guardian Spirits to choose from in Nioh, each with their own special attributes and passive effects that apply to your character. More effects can be unlocked by leveling up your personal Spirit stat. Guardian Spirits also have a meter that fills up each time you defeat an enemy. 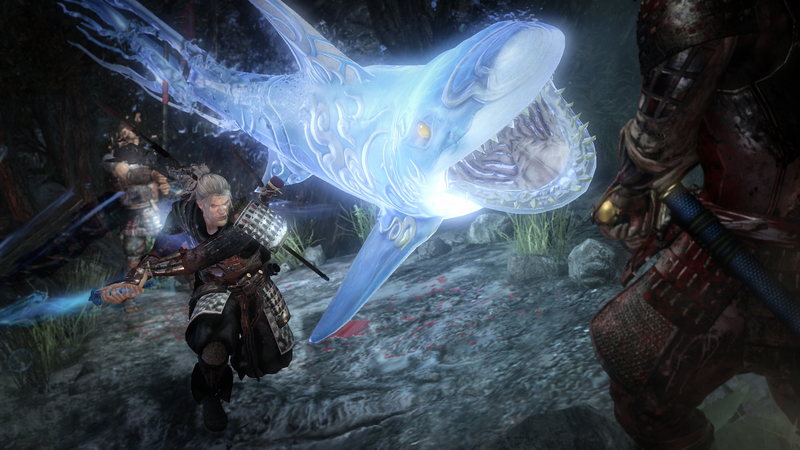 At full charge, the Guardian Spirit allows the player to unleash a powerful Living Weapon attack unique to the creature the spirit represents. Open the Change Guardian Spirit tab when you wish to swap out one Guardian Spirit for another. In Nioh, sometimes it’s just too dangerous to go alone, so you’ll need to summon a companion for some jolly cooperation. When you want to summon another player into a mission that you’ve already started, you’ll need to go to the Summon Visitor tab and offer an Ochoko Cup to the Shrine. Ochoko Cups can be found in loot containers, and can be earned by helping another player complete a mission when summoned. If you want to be summoned to help another player, you can do so by selecting a mission from the world map and pressing Square to begin matchmaking. You will eventually be summoned to a mission for a random player who has offered an Ochoko Cup. Summoning is different from direct co-op through the Torii Gate, which allows you to invite specific friends to join you for a mission from the main menu. The Ready Jutsu tab allows players to apply an unlocked Jutsu to their character. Jutsus provide you with various types of tactical consumable items, such as Shiruken or Talismans. Like Elixirs, Jutsu items are replenished upon praying at a Shrine. Jutsus consist of Ninjutsu and Onmyo Magic items and abilities that are unlocked in the Learn Skills menu. Once you learn a Jutsu, you must enable it within the Ready Jutsu tab in order to use it. The type of Jutsu you can equip depends on your Jutsu cost total and capacity limit. Kodama are the adorable green spirits that inhabit the outside of your Shrine. Each Kodama corresponds to a certain type of Kodama Blessing, which acts as an additional perk for your character while you’re exploring a mission. Open the Receive Kodama Blessing tab to select and apply an available blessing. Head over to our Nioh guide on How to Use Kodama for details. Check out our Nioh Tips guide for additional advice to help you survive Nioh!